My Legacy Turbo came with some pretty large brakes on the front, 10.9" vented. Even compared with the 98-01 Impreza RS, they're slightly bigger. 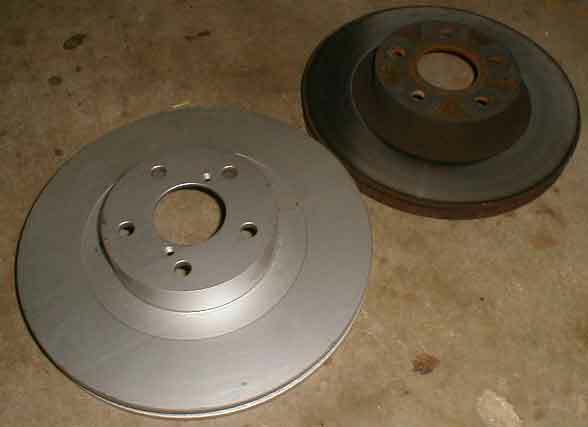 Jason told me that his friend Richard had a set of new rotors and almost-new calipers for an Outback. 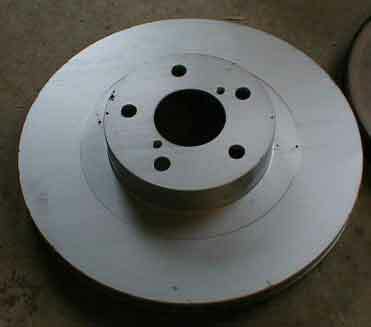 These are the new 11.4" versions that the WRX, Outback and Legacy GT are using. He did have the set of four, but i was just interested in the front two. About two weeks ago i noticed a scraping noise from my brakes. Come to find out the inside pad on the driver side had worn right to the metal and it was tearing into my rotor. While the outside pad had a few miles left, the inside was mysteriously wearing faster. This is what i get for not changing the pads first thing. So, with the desire to get better brakes with newer equipment, i sent him a check and he sent me the hardware. 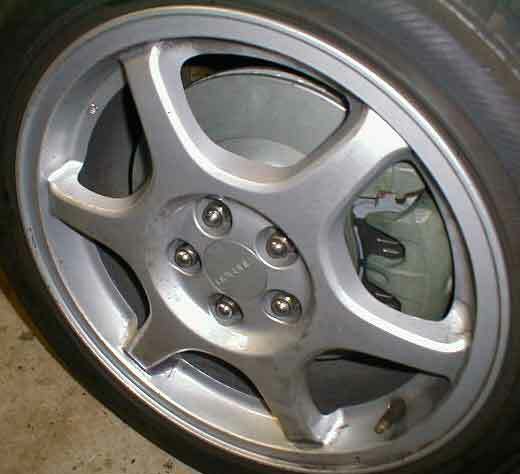 If you've ever seen the wheel spindle and brakes from a car that's spent more than 8 years in a state with hot summers and cold, wet winters where a lot, and i mean a lot, of sand is used on the roads, it's not a pretty sight. Rust everywhere. First thing to do is remove the wheel. Simple. 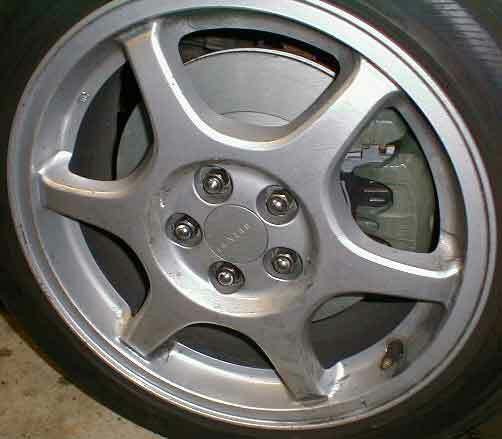 Second, remove the lower caliper bolt that keeps the pads in. rotate it up and remove the pads. 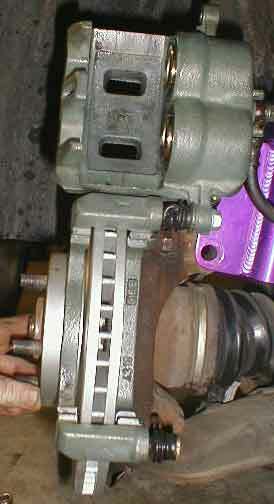 Third, remove the two bolts holding the caliper to the spindle. These were VERY tight on mine. Removing the lower strut bolt might be necessary to get to the top bolt. Fourth, disconnect the brake line from the caliper. Remember to remove the top from the brake fluid reservoir. It will drip fluid from the line and there will be fluid in the caliper as well. Try not to make a huge mess. Fifth, reconnect the line to the new caliper, using the new bolt if applicable. 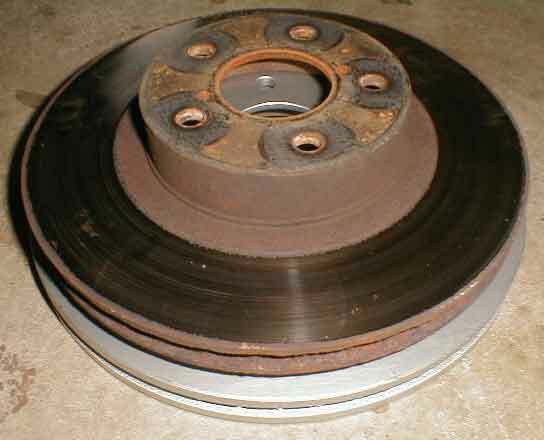 Tighten it good, there's a lot of pressure there and you don't want your brakes to fail. Sixth, remove the ABS sensor and replace the rock guard. I couldn't get the sensor out, so i had to use the smaller rock guard instead. It should be ok, this isn't a rallycross car anyway. 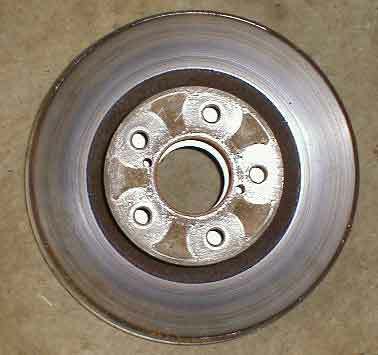 Seventh, put the new rotor on. Eighth, line up the caliper and thread the bolts. This is tricky because there's not a lot of room, the caliper is heavy, and the bolts will usually be covered in rust and be difficult to work. An extra hand, if available, helps a lot. Ninth. Install the brake pads. Install the clips on the top and bottom of the caliper first, then put the silver and black covers on the pads. 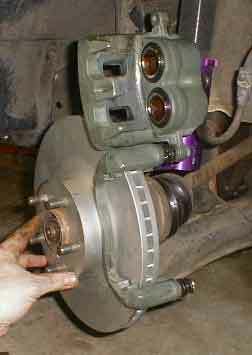 Install the pads and lower the caliper over them. Install the bottom bolt and tighten. Tenth. Bleed the brakes. Since i've never really bled brakes before, i probably did this wrong, but it worked. I just used a small tube and container with a friend pumping the brakes a few times. The fluid had no bubbles, so the job was easy. Eleventh. Check every bolt and nut again. Thirteenth. Drive. Be hard on them at first, give them a few hard stops and miles to break in. Warping these would be a task in itself.